My friend Sky is amazing. Her husband is a fighter pilot for the Navy and will be on deployment for longer than she'd like. She 'mans' the home front in his absence and takes care of their children, home and lots of friendly little animals. Recently I was sent some titles for review for Sleeping Bear Press and upon opening up the packages, I knew I'd want to package them back up and ship them off to Sky who will absolutely adore these titles. Gifting her with these review copies seems like the least I can do, considering all that her family does for our country, wouldn't you agree? 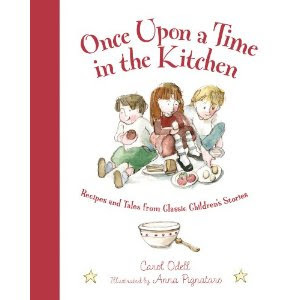 Once Upon a Time in the Kitchen : Recipes and Tales from Classic Children's Stories. Since I know you love to read, you'll enjoy looking through these recipe and meal ideas surrounding stories such as Winnie-the-Pooh (Bear Honey and Nut Spread), The Secret Garden (Secret Garden Two-tone Smoothie), The Town Mouse and the Country Mouse (Cheese Pillows), Robinson Crusoe (Robinson Crusoe Island Fried Rice) and others. This is a cute and delightful way to enjoy your books and your mealtimes. I know you'll be looking for ways to have fun with your kids this summer and reading great literature and celebrating it is one idea for passing the time and building great memories. I think you'll like it! Now, the next book caused me to let out a squeal because Sky and her husband named their first born after a Gladiator. 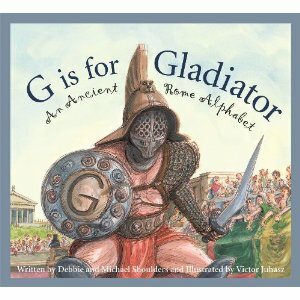 G is for Gladiators: An Ancient Rome Alphabet is going to rock M's socks off! In this book you get a little Roman History from A (is for archaeologist) to Z (is for Zama, the battle of which ended a seventeen-year war.) Naturally, you can also expect to see gladiators. This book is illustrated by Victor Juhasz who has a rather unique style and uses a lot of scribbles and lines to bring his scenes to life. It's really different than other Sleeping Bear titles I've seen but it makes the chariot race look fast and furious (and dusty!) I hope M likes it and I can't wait to get these off to you for this book alone! 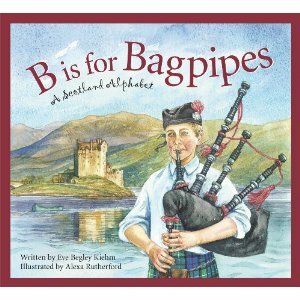 B is for Bagpipes: A Scotland Alphabet which is part of Sleeping Bear Press's Discover the World series. Why do I think Sky will LOVE this book? Because she and her husband honeymooned in Scotland! I know you'd rather have your fighter pilot home with you, but I do hope you'll enjoy looking through this book and remembering the places that you went with your hero husband. One of my first memories of our friendship is sitting in your living room and looking at pictures that you took of this gorgeous land. I remember you showing pictures of the Isle of Skye (which is, of course, mentioned in this book.) I think my favorite page spread in this book is D is for dance. It's a fun page with a curious mention on the history of kilts which I found fascinating. Having never been to Scotland, I enjoyed reading this book, but I know you will enjoy it even more having been able to experience it for yourself! More than the books though, you know you have my prayers and support. I appreciate you and love you so much! Enjoy these books, courtesy of Sleeping Bear Press and myself! For the rest of you - when Sky and her family come to mind, I know she'd appreciate prayers for her family's safety and that she would rise to the occasion and praise God - even when the going gets rough. Thank you, Sky, for the sacrifices you and your family make on behalf of my family!!! And Once Upon a Time in a Kitchen? LOOKS AMAZING!!!! It would be great to use with literature unit studies for home school. I am overwhelmed! Thank you dear friend! I will treasure these books and we will read them out loud and enjoy the moments spent together! I am really looking forward to reading them!